The intent of the laws is to “impede both women and medical providers so systematically that abortion becomes more onerous and even unavailable to many,” according to the lawsuit. Abortion services are still provided in the Phoenix and Tucson areas, as well as Flagstaff. But the Flagstaff clinic didn’t offer abortion services for three years because Planned Parenthood was unable to recruit a medical professional who met the state’s requirements. 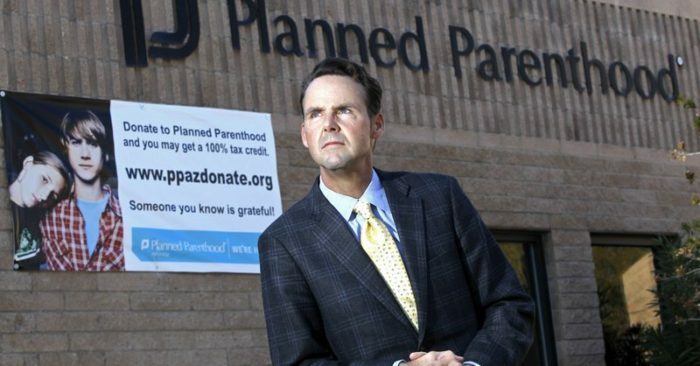 “This is a travesty,” Bryan Howard, president of Planned Parenthood of Arizona, said in a conference call with reporters. The Department of Health Services declined to comment on the lawsuit, and the offices of McSorley and Ridenour didn’t immediately respond to an email seeking comment. Cathi Herrod, president of the Center for Arizona Policy, which backs anti-abortion legislation but isn’t a party to the lawsuit, said the laws being challenged are vital to ensuring that women who are considering an abortion are able to make informed decisions. The lawsuit said women who live near clinics face delays because there are too few providers to meet the demand for abortion services. Women who don’t live near clinics face similar delays, plus they must travel long distances to get to clinics, Howard said.